M-2 high speed steel for strength with black oxide coating for heat and wear resistance in wood, metal or plastic applications; split point ensures a true start and eliminates bit walking. High speed steel with M-35, five percent cobalt, for higher heat and abrasion resistance; heavy-duty web construction for strength and durability. Split point begins drilling immediately, minimizing bit walk when used in applications such as metal drilling, including heavy-duty abrasive alloy metal drilling on hardened steel (heat-treated). High speed steel with M-35, five percent cobalt, for higher heat and abrasion resistance; heavy-duty web construction for strength and durability. Split point begins drilling immediately, minimizing bit walk when used in applications such as metal drilling, including heavy-duty abrasive alloy metal drilling on hardened steel (heat-treated). High speed steel bits used for general purpose drilling in wood, metal and plastic. Jobber length. Black oxide for durability, longer life and faster drill times, bits feature a parabolic flute that clears chips faster; split point drills on contact and prevents walking; jobber length. High speed steel with M-35, five percent cobalt, for higher heat and abrasion resistance; heavy-duty web construction for strength and durability. Split point begins drilling immediately, minimizing bit walk when used in applications such as metal drilling, including heavy-duty abrasive alloy metal drilling on hardened steel (heat-treated). Each metal drill bit is manufactured to exacting specifications and features a split point that starts on contact with no walking or skating, eliminating the need for a center punch. Offers superior durability, speed and selection to support most general purpose applications. Speed helix design for three times faster drilling than standard bits. Easier drilling, reduced heat and extended drill bit life. For use in steel, copper, aluminum, brass, oak, maple, MDF, pine, PVC, polycarbonate, acrylic, ABS, nylon and composite materials. Black oxide for durability, longer life and faster drill times, bits feature a parabolic flute that clears chips faster; split point drills on contact and prevents walking; jobber length. M-2 high speed steel for strength with black oxide coating for heat and wear resistance in wood, metal or plastic applications; split point ensures a true start and eliminates bit walking. High speed steel bits used for general purpose drilling in wood, metal and plastic. Jobber length. Titanium Nitride coating reduces friction and last longer, cutting edge stays sharper longer. Used in repetitive metal drilling with portable drills or stationary drill press. Jobber length. High speed M-2 steel bit drills exact size hole for tapping; use where non fractional sized holes are required in automotive, MRO, portable drill or stationary drill press applications. Jobber length. High speed steel bits used for general purpose drilling in wood, metal and plastic. Jobber length. Black oxide for durability, longer life and faster drill times, bits feature a parabolic flute that clears chips faster; split point drills on contact and prevents walking; jobber length. Titanium Nitride coating reduces friction and last longer, cutting edge stays sharper longer. Used in repetitive metal drilling with portable drills or stationary drill press. Jobber length. High speed steel with black oxide treatment that reduces friction between bit and workpiece. Split point starts on contact in metal, wood and plastic; eliminates walking or skating when drilling into metal; 135 degree split point on all bits above 1/8"; jobber length. High speed M-2 steel bit drills exact size hole for tapping; use where non fractional sized holes are required in automotive, MRO, portable drill or stationary drill press applications. Jobber length. M-2 high speed steel for strength with black oxide coating for heat and wear resistance in wood, metal or plastic applications; split point ensures a true start and eliminates bit walking. High speed M-2 steel bit drills exact size hole for tapping; use where non fractional sized holes are required in automotive, MRO, portable drill or stationary drill press applications. Jobber length. Each metal drill bit is manufactured to exacting specifications and features a split point that starts on contact with no walking or skating, eliminating the need for a center punch. Offers superior durability, speed and selection to support most general purpose applications. Speed helix design for three times faster drilling than standard bits. Easier drilling, reduced heat and extended drill bit life. For use in steel, copper, aluminum, brass, oak, maple, MDF, pine, PVC, polycarbonate, acrylic, ABS, nylon and composite materials. High speed M-2 steel bit drills exact size hole for tapping; use where non fractional sized holes are required in automotive, MRO, portable drill or stationary drill press applications. Jobber length. High speed M-2 steel bit drills exact size hole for tapping; use where non fractional sized holes are required in automotive, MRO, portable drill or stationary drill press applications. Jobber length. Titanium Nitride coating reduces friction and last longer, cutting edge stays sharper longer. Used in repetitive metal drilling with portable drills or stationary drill press. Jobber length. High speed M-2 steel bit drills exact size hole for tapping; use where non fractional sized holes are required in automotive, MRO, portable drill or stationary drill press applications. Jobber length. High speed M-2 steel bit drills exact size hole for tapping; use where non fractional sized holes are required in automotive, MRO, portable drill or stationary drill press applications. Jobber length. High speed M-2 steel bit drills exact size hole for tapping; use where non fractional sized holes are required in automotive, MRO, portable drill or stationary drill press applications. Jobber length. Black oxide for durability, longer life and faster drill times, bits feature a parabolic flute that clears chips faster; split point drills on contact and prevents walking; jobber length. High speed M-2 steel bit drills exact size hole for tapping; use where non fractional sized holes are required in automotive, MRO, portable drill or stationary drill press applications. Jobber length. High speed steel with black oxide treatment that reduces friction between bit and workpiece. Split point starts on contact in metal, wood and plastic; eliminates walking or skating when drilling into metal; 135 degree split point on all bits above 1/8"; jobber length. High speed M-2 steel bit drills exact size hole for tapping; use where non fractional sized holes are required in automotive, MRO, portable drill or stationary drill press applications. Jobber length. High speed steel with M-35, five percent cobalt, for higher heat and abrasion resistance; heavy-duty web construction for strength and durability. Split point begins drilling immediately, minimizing bit walk when used in applications such as metal drilling, including heavy-duty abrasive alloy metal drilling on hardened steel (heat-treated). High speed M-2 steel bit drills exact size hole for tapping; use where non fractional sized holes are required in automotive, MRO, portable drill or stationary drill press applications. Jobber length. High speed M-2 steel bit drills exact size hole for tapping; use where non fractional sized holes are required in automotive, MRO, portable drill or stationary drill press applications. Jobber length. High speed M-2 steel bit drills exact size hole for tapping; use where non fractional sized holes are required in automotive, MRO, portable drill or stationary drill press applications. Jobber length. High speed steel bits used for general purpose drilling in wood, metal and plastic. Jobber length. High speed M-2 steel bit drills exact size hole for tapping; use where non fractional sized holes are required in automotive, MRO, portable drill or stationary drill press applications. Jobber length. Titanium Nitride coating reduces friction and last longer, cutting edge stays sharper longer. Used in repetitive metal drilling with portable drills or stationary drill press. Jobber length. High speed steel bits used for general purpose drilling in wood, metal and plastic. Jobber length. Black oxide for durability, longer life and faster drill times, bits feature a parabolic flute that clears chips faster; split point drills on contact and prevents walking; jobber length. Each metal drill bit is manufactured to exacting specifications and features a split point that starts on contact with no walking or skating, eliminating the need for a center punch. Offers superior durability, speed and selection to support most general purpose applications. Speed helix design for three times faster drilling than standard bits. Easier drilling, reduced heat and extended drill bit life. For use in steel, copper, aluminum, brass, oak, maple, MDF, pine, PVC, polycarbonate, acrylic, ABS, nylon and composite materials. Universal chuck key holder attaches your chuck key directly to your drill cord to help keep it where you need it. 30252 Fits most brands of 1/4", and 3/8" chuck keys; 30253 is universal. Black rubber. Rotary percussion bits made of chrome vanadium shaft through hardened to 50-53HrC. Shot-peened, double tempered finish reduces breakage, copper braze material gives high heat resistance and flute geometry removes dust from the hole quicker for fast drilling and long life. Used in applications such as rotary drilling in concrete, brick and masonry. High speed M-2 steel bit drills exact size hole for tapping; use where non fractional sized holes are required in automotive, MRO, portable drill or stationary drill press applications. Jobber length. High speed M-2 steel bit drills exact size hole for tapping; use where non fractional sized holes are required in automotive, MRO, portable drill or stationary drill press applications. Jobber length. Milwaukee Thunderbolt Cobalt drill bits are designed for extreme durability and long life in specialty applications. The Thunderbolt web features a thicker core than a standard drill bit to provide ultimate strength and protect against side-load breakage. A specially designed parabolic flute form clears chips and debris fast to keep the bit cool. The 135? split point tip delivers a precision start and prevents walking for fast, accurate holes. Effective for drilling on curved surfaces, Milwaukee Thunderbolt Cobalt bits require less effort to drill through stainless steel, high alloy steel and cast iron. Highly recommended for use with portable drills. Black oxide for durability, longer life and faster drill times, bits feature a parabolic flute that clears chips faster; split point drills on contact and prevents walking; jobber length. Black oxide for durability, longer life and faster drill times, bits feature a parabolic flute that clears chips faster; split point drills on contact and prevents walking; jobber length. Rotary percussion bits made of chrome vanadium shaft through hardened to 50-53HrC. Shot-peened, double tempered finish reduces breakage, copper braze material gives high heat resistance and flute geometry removes dust from the hole quicker for fast drilling and long life. Used in applications such as rotary drilling in concrete, brick and masonry. Black oxide for durability, longer life and faster drill times, bits feature a parabolic flute that clears chips faster; split point drills on contact and prevents walking; jobber length. High speed steel with black oxide treatment that reduces friction between bit and workpiece. Split point starts on contact in metal, wood and plastic; eliminates walking or skating when drilling into metal; 135 degree split point on all bits above 1/8"; jobber length. Nickel plated for fast, smooth performance. Carbide tip can be used for rotary drilling applications also for deep drilling. Slow spiral for quick and easy debris removal; 7/16" and larger drill bits have reduced shanks. Made of industrial strength cobalt for optimum life and durability with maximum speed in stainless steel and other hard metals. Tip starts on contact and eliminates bit walking. High speed M-2 steel bit drills exact size hole for tapping; use where non fractional sized holes are required in automotive, MRO, portable drill or stationary drill press applications. Jobber length. No-spin shank eliminates the frustration of bit spinning in the chuck. Tapered web provides greater durability to reduce breaking. Size markings are located above the shank to prevent wearing away. Jobber length. Nickel plated for fast, smooth performance. Carbide tip can be used for rotary drilling applications also for deep drilling. Slow spiral for quick and easy debris removal; 7/16" and larger drill bits have reduced shanks. Each metal drill bit is manufactured to exacting specifications and features a split point that starts on contact with no walking or skating, eliminating the need for a center punch. Offers superior durability, speed and selection to support most general purpose applications. Speed helix design for three times faster drilling than standard bits. Easier drilling, reduced heat and extended drill bit life. For use in steel, copper, aluminum, brass, oak, maple, MDF, pine, PVC, polycarbonate, acrylic, ABS, nylon and composite materials. Rotary percussion bits made of chrome vanadium shaft through hardened to 50-53HrC. Shot-peened, double tempered finish reduces breakage, copper braze material gives high heat resistance and flute geometry removes dust from the hole quicker for fast drilling and long life. Used in applications such as rotary drilling in concrete, brick and masonry. Black oxide for durability, longer life and faster drill times, bits feature a parabolic flute that clears chips faster; split point drills on contact and prevents walking; jobber length. Milwaukee Thunderbolt Cobalt drill bits are designed for extreme durability and long life in specialty applications. The Thunderbolt web features a thicker core than a standard drill bit to provide ultimate strength and protect against side-load breakage. A specially designed parabolic flute form clears chips and debris fast to keep the bit cool. The 135? split point tip delivers a precision start and prevents walking for fast, accurate holes. Effective for drilling on curved surfaces, Milwaukee Thunderbolt Cobalt bits require less effort to drill through stainless steel, high alloy steel and cast iron. Highly recommended for use with portable drills. High speed steel bits used for general purpose drilling in wood, metal and plastic. Jobber length. High speed M-2 steel bit drills exact size hole for tapping; use where non fractional sized holes are required in automotive, MRO, portable drill or stationary drill press applications. Jobber length. High speed M-2 steel bit drills exact size hole for tapping; use where non fractional sized holes are required in automotive, MRO, portable drill or stationary drill press applications. Jobber length. Nickel plated for fast, smooth performance. Carbide tip can be used for rotary drilling applications also for deep drilling. Slow spiral for quick and easy debris removal; 7/16" and larger drill bits have reduced shanks. Made of industrial strength cobalt for optimum life and durability with maximum speed in stainless steel and other hard metals. Tip starts on contact and eliminates bit walking. Full cone threaded tip provides the speed needed to drill faster by pulling the bit through the material with Features a full cone threaded tip for fast drilling, contoured paddle for fast chip removal, hex shank power groove to reduce slippage and spur and reamer tips for cleaner holes. Use in applications such as drilling in hardwoods, composites, treated lumber, railroad ties and other wood products. Each metal drill bit is manufactured to exacting specifications and features a split point that starts on contact with no walking or skating, eliminating the need for a center punch. Offers superior durability, speed and selection to support most general purpose applications. Speed helix design for three times faster drilling than standard bits. Easier drilling, reduced heat and extended drill bit life. For use in steel, copper, aluminum, brass, oak, maple, MDF, pine, PVC, polycarbonate, acrylic, ABS, nylon and composite materials. High speed steel with black oxide treatment that reduces friction between bit and workpiece. Split point starts on contact in metal, wood and plastic; eliminates walking or skating when drilling into metal; 135 degree split point on all bits above 1/8"; jobber length. High quality steel with black oxide finish for corrosion resistance when used in applications such as automotive, MRO, portable drills, stationary drill press; 1/4" hex shank with quick change for ease of use in impact drivers and quick change drill/drivers. Full cone threaded tip provides the speed needed to drill faster by pulling the bit through the material with Features a full cone threaded tip for fast drilling, contoured paddle for fast chip removal, hex shank power groove to reduce slippage and spur and reamer tips for cleaner holes. Use in applications such as drilling in hardwoods, composites, treated lumber, railroad ties and other wood products. Full cone threaded tip provides the speed needed to drill faster by pulling the bit through the material with Features a full cone threaded tip for fast drilling, contoured paddle for fast chip removal, hex shank power groove to reduce slippage and spur and reamer tips for cleaner holes. Use in applications such as drilling in hardwoods, composites, treated lumber, railroad ties and other wood products. Impact duty titanium drill bits with Red Helix are engineered for impacts and drills. Designed with a variable Helix with an aggressive 35? Helix angle which ends at 15?. Limits heat build-up to stay sharper longer. The 135? split point tip delivers a precision start and prevents walking for fast, accurate holes. Can be used in all drilling applications to give you up to 3 times the life verses Black Oxide drill bits. High speed M-2 steel bit drills exact size hole for tapping; use where non fractional sized holes are required in automotive, MRO, portable drill or stationary drill press applications. Jobber length. High speed steel with black oxide coating for longer life; split point tip prevents walking when drilling in wood, metal, plastic and features the Rapid Load Quick Change system; 1/4" hex shank. High speed M-2 steel bit drills exact size hole for tapping; use where non fractional sized holes are required in automotive, MRO, portable drill or stationary drill press applications. Jobber length. High speed M-2 steel bit drills exact size hole for tapping; use where non fractional sized holes are required in automotive, MRO, portable drill or stationary drill press applications. Jobber length. High speed M-2 steel bit drills exact size hole for tapping; use where non fractional sized holes are required in automotive, MRO, portable drill or stationary drill press applications. Jobber length. Each metal drill bit is manufactured to exacting specifications and features a split point that starts on contact with no walking or skating, eliminating the need for a center punch. Offers superior durability, speed and selection to support most general purpose applications. Speed helix design for three times faster drilling than standard bits. Easier drilling, reduced heat and extended drill bit life. For use in steel, copper, aluminum, brass, oak, maple, MDF, pine, PVC, polycarbonate, acrylic, ABS, nylon and composite materials. High speed steel with M-35, five percent cobalt, for higher heat and abrasion resistance; heavy-duty web construction for strength and durability. Split point begins drilling immediately, minimizing bit walk when used in applications such as metal drilling, including heavy-duty abrasive alloy metal drilling on hardened steel (heat-treated). Rock carbide tip maximizes carbide surface contact for longer bit life; four flutes clean debris out for fast, efficient drilling and three flats on shank eliminate bit slipping in chuck. Rock carbide tip maximizes carbide surface contact for longer bit life; four flutes clean debris out for fast, efficient drilling and three flats on shank eliminate bit slipping in chuck. Titanium Nitride coating reduces friction and last longer, cutting edge stays sharper longer. Used in repetitive metal drilling with portable drills or stationary drill press. Jobber length. Full cone threaded tip provides the speed needed to drill faster by pulling the bit through the material with Features a full cone threaded tip for fast drilling, contoured paddle for fast chip removal, hex shank power groove to reduce slippage and spur and reamer tips for cleaner holes. Use in applications such as drilling in hardwoods, composites, treated lumber, railroad ties and other wood products. High speed steel with black oxide treatment that reduces friction between bit and workpiece. Split point starts on contact in metal, wood and plastic; eliminates walking or skating when drilling into metal; 135 degree split point on all bits above 1/8"; jobber length. Designed for extreme durability and long life. For specialty drilling in hard metals like stainless steel. Parabolic flute form clears chips and debris fast to keep the bit cool. Ideal for drilling on curved surfaces. 135 degree split point tip starts on contact to keep the bit from walking for fast accurate holes. Thick core provides strength and protects against side load breakage. Designed for extreme durability and long life. For specialty drilling in hard metals like stainless steel. Parabolic flute form clears chips and debris fast to keep the bit cool. Ideal for drilling on curved surfaces. 135 degree split point tip starts on contact to keep the bit from walking for fast accurate holes. Thick core provides strength and protects against side load breakage. Nickel plated for fast, smooth performance. Carbide tip can be used for rotary drilling applications also for deep drilling. Slow spiral for quick and easy debris removal; 7/16" and larger drill bits have reduced shanks. Titanium Nitride coating reduces friction and last longer, cutting edge stays sharper longer. Used in repetitive metal drilling with portable drills or stationary drill press. Jobber length. Titanium coating for 3 times longer life verses black oxide. Shockwave impact duty, engineered for drills and impacts. Red Helix design for rapid chip removal to limit heat build-up to stay sharper longer. 135? split point for precision start no walking for fast accurate holes. M-2 high speed steel for strength with black oxide coating for heat and wear resistance in wood, metal or plastic applications; split point ensures a true start and eliminates bit walking. Hardened carbon steel for strength, fits hex shank type 1L and 2L with shank size 1/2" and larger, shank type 5L with shank size 3/8" and larger. Rock carbide tip maximizes carbide surface contact for longer bit life; four flutes clean debris out for fast, efficient drilling and three flats on shank eliminate bit slipping in chuck. High speed M-2 steel bit drills exact size hole for tapping; use where non fractional sized holes are required in automotive, MRO, portable drill or stationary drill press applications. Jobber length. High speed M-2 steel bit drills exact size hole for tapping; use where non fractional sized holes are required in automotive, MRO, portable drill or stationary drill press applications. Jobber length. High speed M-2 steel bit drills exact size hole for tapping; use where non fractional sized holes are required in automotive, MRO, portable drill or stationary drill press applications. Jobber length. M-2 high speed steel for strength with black oxide coating for heat and wear resistance in wood, metal or plastic applications; split point ensures a true start and eliminates bit walking. Full cone threaded tip provides the speed needed to drill faster by pulling the bit through the material with Features a full cone threaded tip for fast drilling, contoured paddle for fast chip removal, hex shank power groove to reduce slippage and spur and reamer tips for cleaner holes. Use in applications such as drilling in hardwoods, composites, treated lumber, railroad ties and other wood products. Impact duty titanium drill bits with Red Helix are engineered for impacts and drills. Designed with a variable Helix with an aggressive 35? Helix angle which ends at 15?. Limits heat build-up to stay sharper longer. The 135? split point tip delivers a precision start and prevents walking for fast, accurate holes. Can be used in all drilling applications to give you up to 3 times the life verses Black Oxide drill bits. Black oxide for durability, longer life and faster drill times, bits feature a parabolic flute that clears chips faster; split point drills on contact and prevents walking; jobber length. High speed steel with black oxide treatment that reduces friction between bit and workpiece. Split point starts on contact in metal, wood and plastic; eliminates walking or skating when drilling into metal; 135 degree split point on all bits above 1/8"; jobber length. High speed steel with black oxide treatment that reduces friction between bit and workpiece. Split point starts on contact in metal, wood and plastic; eliminates walking or skating when drilling into metal; 135 degree split point on all bits above 1/8"; jobber length. Rotary percussion bits made of chrome vanadium shaft through hardened to 50-53HrC. Shot-peened, double tempered finish reduces breakage, copper braze material gives high heat resistance and flute geometry removes dust from the hole quicker for fast drilling and long life. Used in applications such as rotary drilling in concrete, brick and masonry. High speed steel with black oxide treatment that reduces friction between bit and workpiece. Split point starts on contact in metal, wood and plastic; eliminates walking or skating when drilling into metal; 135 degree split point on all bits above 1/8"; jobber length. Rock carbide tip maximizes carbide surface contact for longer bit life; four flutes clean debris out for fast, efficient drilling and three flats on shank eliminate bit slipping in chuck. Bosch Jobber Drill Bit, 1/16 in Diameter, 1-7/8 in Overall Length, 2 Flutes, Twist Flute, 1/16 in Shank, Straight Shank, 118 deg Point, Split Point, Titanium Coated, Applicable Materials: Sheet Metal Ducts, Steel, Copper, Brass, Aluminum, Plastic, Plexiglas, Wood, Veneers, Vinyl Siding, Plasterboard, PVC, Stainless Steel and Cast Iron High speed steel features a black body and gold flute with Turbomax tip for burr-free holes. Exact centering; no walking on straight and curved surfaces. Three flatted shank on 3/16" and above for better chuck grip. Jobbers length. Made of industrial strength cobalt for optimum life and durability with maximum speed in stainless steel and other hard metals. Tip starts on contact and eliminates bit walking. High speed steel with M-35, five percent cobalt, for higher heat and abrasion resistance; heavy-duty web construction for strength and durability. Split point begins drilling immediately, minimizing bit walk when used in applications such as metal drilling, including heavy-duty abrasive alloy metal drilling on hardened steel (heat-treated). Carbide tip minimizes wear and extends the life of the bit. Used in applications such as drilling in brick, cinder block and tile. Titanium coating for 3 times longer life verses black oxide. Shockwave impact duty, engineered for drills and impacts. Red Helix design for rapid chip removal to limit heat build-up to stay sharper longer. 135? split point for precision start no walking for fast accurate holes. Titanium coating for 3 times longer life verses black oxide. Shockwave impact duty, engineered for drills and impacts. Red Helix design for rapid chip removal to limit heat build-up to stay sharper longer. 135? split point for precision start no walking for fast accurate holes. Titanium Nitride coating reduces friction and last longer, cutting edge stays sharper longer. Used in repetitive metal drilling with portable drills or stationary drill press. Jobber length. High quality steel with black oxide finish for corrosion resistance when used in applications such as automotive, MRO, portable drills, stationary drill press; 1/4" hex shank with quick change for ease of use in impact drivers and quick change drill/drivers. High speed steel with M-35, five percent cobalt, for higher heat and abrasion resistance; heavy-duty web construction for strength and durability. Split point begins drilling immediately, minimizing bit walk when used in applications such as metal drilling, including heavy-duty abrasive alloy metal drilling on hardened steel (heat-treated). Rock carbide tip maximizes carbide surface contact for longer bit life; four flutes clean debris out for fast, efficient drilling and three flats on shank eliminate bit slipping in chuck. Blue groove point and cutting edge for faster chip removal, double cutting spurs scribe the outside of the hole reducing breakout. Grooved hex shank prevents slipping in drill chuck or bit extension and fits all standard quick change chucks. 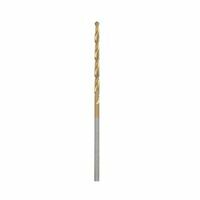 Bosch Jobber Drill Bit, 5/64 in Diameter, 2 in Overall Length, 2 Flutes, Twist Flute, 5/64 in Shank, Straight Shank, 118 deg Point, Split Point, Titanium Coated, Applicable Materials: Sheet Metal Ducts, Steel, Copper, Brass, Aluminum, Plastic, Plexiglas, Wood, Veneers, Vinyl Siding, Plasterboard, PVC, Stainless Steel and Cast Iron High quality steel with black oxide finish for corrosion resistance when used in applications such as automotive, MRO, portable drills, stationary drill press; 1/4" hex shank with quick change for ease of use in impact drivers and quick change drill/drivers. Hardened carbon steel for strength, split point pilot drill for faster penetration and less walking. Rock carbide tip maximizes carbide surface contact for longer bit life; four flutes clean debris out for fast, efficient drilling and three flats on shank eliminate bit slipping in chuck. Full cone threaded tip provides the speed needed to drill faster by pulling the bit through the material with Features a full cone threaded tip for fast drilling, contoured paddle for fast chip removal, hex shank power groove to reduce slippage and spur and reamer tips for cleaner holes. Use in applications such as drilling in hardwoods, composites, treated lumber, railroad ties and other wood products. High speed steel with black oxide coating for longer life; split point tip prevents walking when drilling in wood, metal, plastic and features the Rapid Load Quick Change system; 1/4" hex shank. M7 grade steel with extra hard titanium coating and parabolic bit flutes for strength and maximum service in applications such as metal, wood and plastic; split point prevents walking. M7 grade steel with extra hard titanium coating and parabolic bit flutes for strength and maximum service in applications such as metal, wood and plastic; split point prevents walking. High speed M-2 steel bit drills exact size hole for tapping; use where non fractional sized holes are required in automotive, MRO, portable drill or stationary drill press applications. Jobber length. M7 grade steel with extra hard titanium coating and parabolic bit flutes for strength and maximum service in applications such as metal, wood and plastic; split point prevents walking. High speed steel with black oxide treatment that reduces friction between bit and workpiece. Split point starts on contact in metal, wood and plastic; eliminates walking or skating when drilling into metal; 135 degree split point on all bits above 1/8"; jobber length. High speed steel replacement drill for hole saws. Soft steel handle limits potential for dangerous fracturing under excessive loads. Carbide tip minimizes wear and extends the life of the bit. Used in applications such as drilling in brick, cinder block and tile.